Mounting the dish on to the pillar and top plate has been the longest anticipated and most significant part of the build. It has also proved to be the most technically and logistically difficult and it should not go unnoticed that there have been many delays and much heated discussion about how to approach this potentially dangerous task. 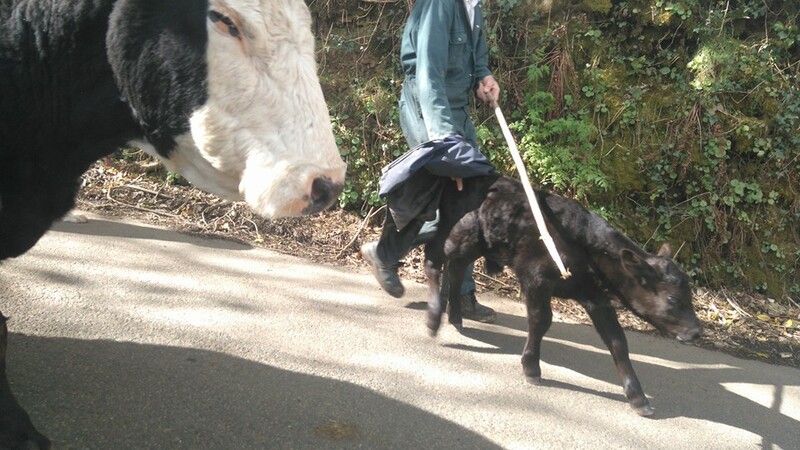 5 members of the XRT-C team headed down to the Caradon Observatory on the 30th April, dodging cows and bad weather to attempt the build. 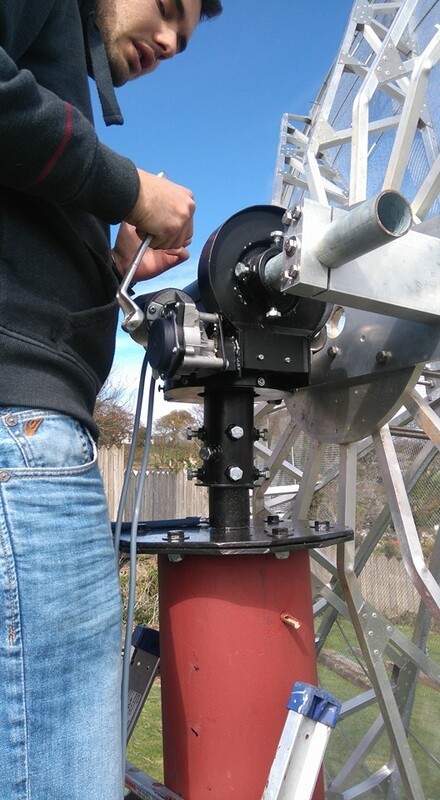 In its simplest form, the primary aims of Build day 8 were to mount first the function rotor unit on the revised top plate, and then mount the dish on to the rotor bracket. In a major PR development Ken the owner of Caradon had managed to arrange for BBC spotlight to send a TV crew and reporter along to film the whole process and take interviews. 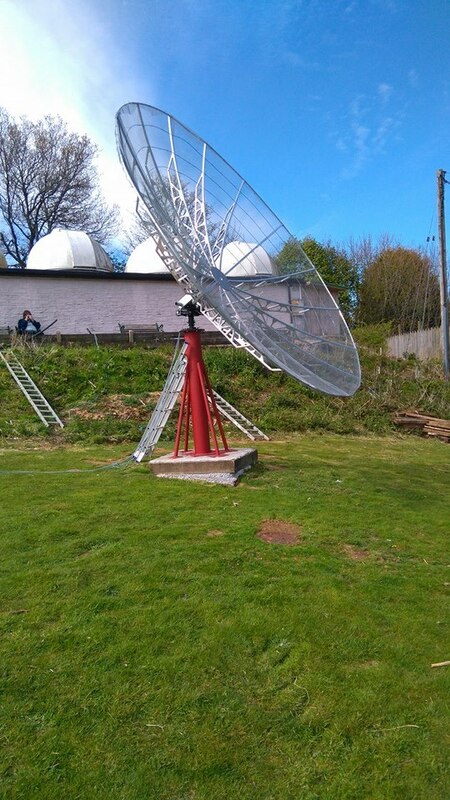 This is a great opportunity to promote the project, but also added extra pressure to ensure everything worked first time and no one was squashed by a falling dish! The Current XRT-C Control Room in the fourth of Caradon’s domes. On the desk, from left to right, we have the Rot2ProG to control the rotor assembly, the computer and monitor that controls the whole setup and the SpectraCyber receiver. On the floor is the cabling and the soon-to-be-mounted rotor assembly being tested. 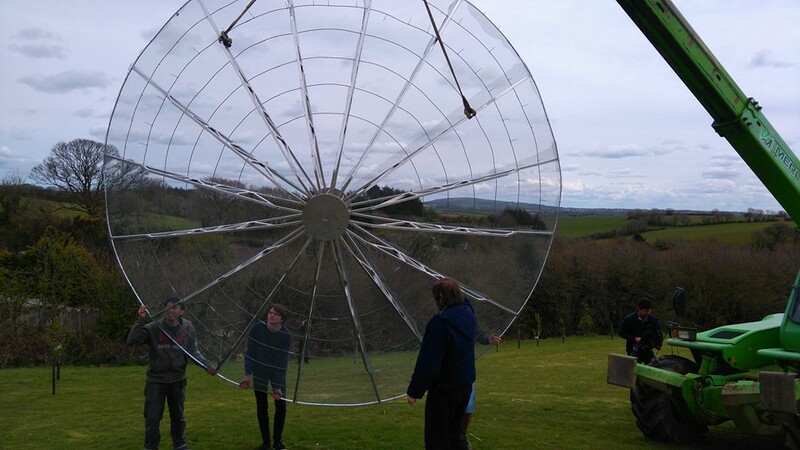 The mechanism of lifting a 4.5m wide, 78kg dish up to a position where it could be screwed on to the rotor bracket was the largest challenge associated with the day. A number of approaches were discussed in advance. Getting enough people to manhandle the dish into position would be free but also very difficult to arrange. Other groups using the RF Hamdesign dishes had hired cherry pickers in the past but this would be primitively expensive. At attempt was made by Ken to construct scaffolding around the stand but this proved too dangerous. In the end Ken was able to secure the services of a local farmer who bought round a bale lifter from which the dish could be suspended from and gently maneuvered into position by hand. During the planning the XRT-C team were somewhat hampered in our planning because none of us had any idea what a bale lifter looked like, but this innovation turned out to be a real life saver. Liffting the rotor unit and bracket into position on the top plate. As discussed in previous posts, wiring up and operating the rotor unit had caused major headaches and delays. 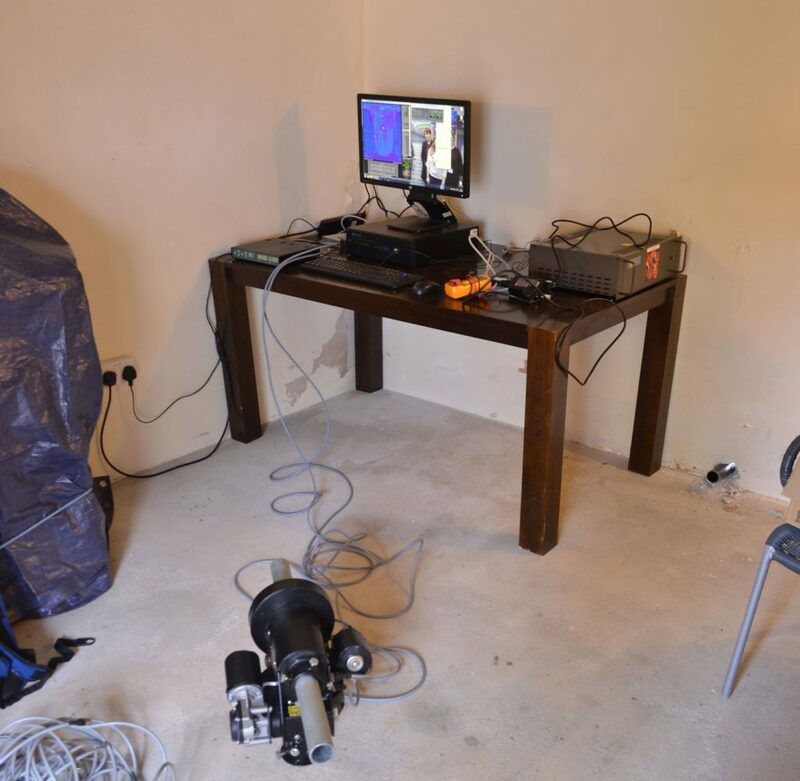 Once this was fully tested the team’s first job of the day was to install the PC and Rot2proG control unit and confirm that nothing had broken en route to the site. It was a cause for celebration when not only the rotor worked first time, but the team were successfully able to get it to automatically track a satellite across the sky. Having set up the control room inside one of the optical domes on the Caradon site. The XRT-C team carefully ran the power cables through a pipe in the wall and down to the structure where the bale lifter was able to lift the rotor on to the top plate. Prior to this the bracket was rotated to 90 degrees to allow easy fitting to the dish hub. As described, the dish was then suspended from the bale lifter via a rope and moved into position by hand. It was all hands on deck to lift the dish into position and carefully thread the screws through the bracket and hub. After a few tense minutes the dish was securely fixed to rotor and could freely stand. Time to test that the rotor was still functional and could move the dish. Here the build started to hit a few problems. Initially no signal could reach the unit. Loose connections were blamed (see this post as to why) and by bypassing this we were able to get this dish moving. The rotor assembly was able to change azimuth on both directions. For elevation there was very little motion. After some panicked minutes discussing the problem the team realised that the rotor was in fact working correctly and that the bracket had not been securely fastened to the rotating part of the rotor. After tightening these bolts elevation change could be achieved but only with support from people manually lifting the dish. This suggests that the torque produced by the motor was insufficient. Torque produced by the rotator is 500Nm maximum at 18V. The input voltage delivered at the motor inputs was measured at 14.8V suggesting that our setup is producing 411Nm. From weight, the torque required to lift the motor when horizontal is roughly 400Nm. Moments from friction is unknown but may be considerable due to the system using worm gears. As a solution, counterweights will be needed. These will need to counter the moments from weight either fully or partially (just enough to allow movement). Currently the dish is specified to be 78kg while the vertical load allowed is up to 318kg. RF Hamdesign offers two designs of counterweights, a €449 and a €479 model. Despite the revelation that we would need to purchase a counter weight, the team left the site buzzing have a successfully over coming arguably the largest hurdle in the project. Standing in front of the enormous dish was an awe-inspiring sight and has really motivated the team after a difficult start to 2016. We hope to be in a position to get first light in the next couple of months. 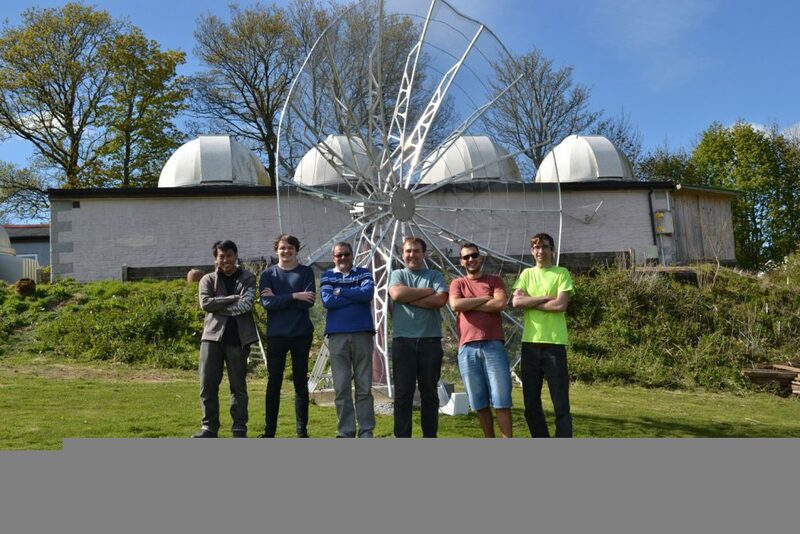 The build team, along with Caradon Observatory owner Ken Bennett, stand in front the newly mounted dish after a hard days work. Written by Damian Rumble, Sam Morrell and Danial Ezry bin Ahmad.